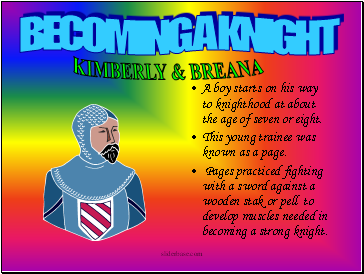 A boy starts on his way to knighthood at about the age of seven or eight. This young trainee was known as a page. 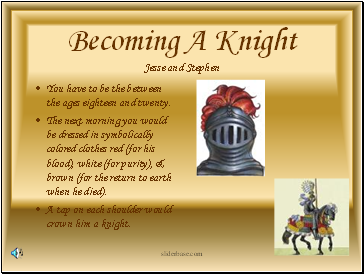 Pages practiced fighting with a sword against a wooden stak or pell to develop muscles needed in becoming a strong knight. You have to be the between the ages eighteen and twenty. The next morning you would be dressed in symbolically colored clothes red (for his blood), white (for purity), & brown (for the return to earth when he died). A tap on each shoulder would crown him a knight. 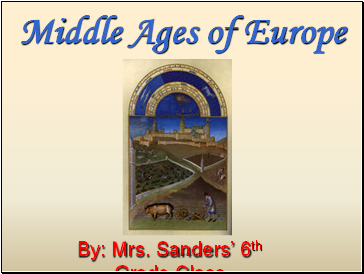 The structures were surrounded by a moat, a ditch filled with water. The gatehouse was the living quarters of the guards over the main gate of the castle. 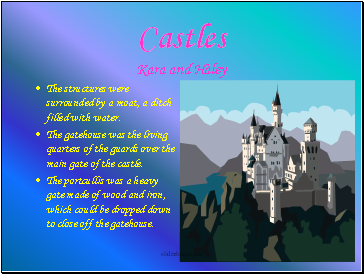 The portcullis was a heavy gate made of wood and iron, which could be dropped down to close off the gatehouse. 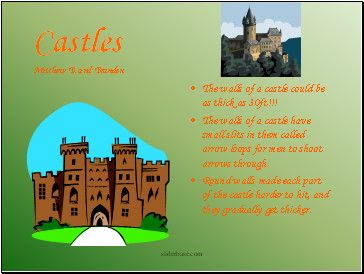 The walls of a castle could be as thick as 30ft!!! The walls of a castle have small slits in them called arrow loops for men to shoot arrows through. Round walls made each part of the castle harder to hit, and they gradually get thicker. Most women and men wore tunics. 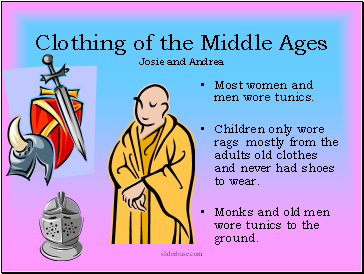 Children only wore rags mostly from the adults old clothes and never had shoes to wear. 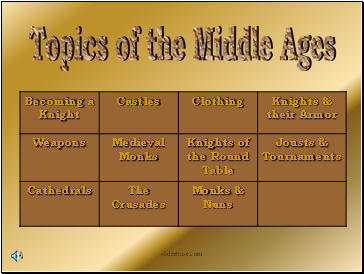 Monks and old men wore tunics to the ground. The suits took 5 years to make. The armor was hand-made by artisans and craftsmen. It took an hour to put on the suit of armor. 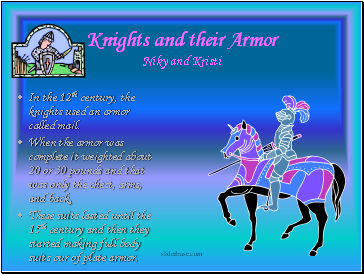 In the 12th century, the knights used an armor called mail. When the armor was complete it weighted about 20 or 30 pounds and that was only the chest, arms, and back. 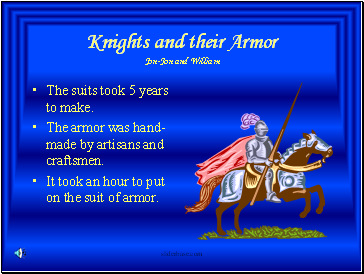 These suits lasted until the 15th century and then they started making full body suits our of plate armor.